Now that we've officially entered 2019, we are entitled to plan our holidays. With 10 long weekends in this year, we are wondering how well we can save up to travel and chill like a boss. So, here's a list for you and where you can go. Thank us later, may be? Does the thought of tan, sea waves crashing at your feet, and booze-fuelled weekend sound like music to your ears? Diu has to be your destination in January as it's also the time when Festa De Diu — Asia's longest music festival happens. With hot air balloon rides, zip lines, bungee jumping, and more adventure activities and workshops, your holiday here will offer more than just beaches. So, pack those playsuits with a gusto for music and get here! While Indian mythology gives a lot of weight to Gokarna during Shiva Ratri, we recommend getting here if you're looking for a quick holiday that also immerses you in a wonderful experience. Gokarna celebrates Shiva Ratri like no other town in the country, where not just the temple but the entire town is lit up! This beach town might be a little crowded during this time of the year, so we suggest making bookings in advance. There is Zostel but if you're looking for other backpackers hostels, there are plenty. 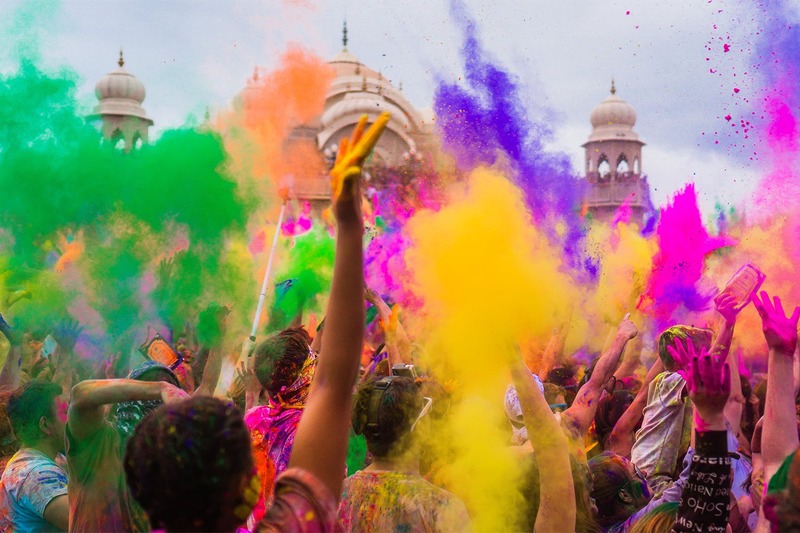 Whenever you watch a Sanjay Leela Bhansali movie, the urge to participate in a Holi celebration that larger than life makes you want to travel to Vrindavan. This temple town in Uttar Pradesh is quite literally drenched in colours. People on the streets are first coloured and then greeted, but the festivities here begin right after Makar Sankranthi. These festivities lead to the main events of Holi and are celebrated for a few more days after. Since Holi is on a Thursday, take a leave on Friday, and make it a really long weekend of colours! Khajjiar in Himachal Pradesh is at its best behaviour in April. Mild summers, snowcapped mountains, fresh breeze are just a few things that will make your stay better. Known as the Switzerland of India, this is a rather tiny grassy meadow that's tucked between ginormous deodar trees. With a pond and small floating islands on the pond, this is a view you wouldn't want to miss. Since Khajjiar doesn't take too long to explore, you might want to head to Dalhousie, which is 22km away. Why would you want to go anywhere away from Hyderabad during Ramzan? The streets of the city are usually lit up and you'll find foodies hustling and relishing the seasonal delicacies and vendors whipping out their best. There shall be food walks, guided tours of the Old City, and of course, haleem. Cannot figure what to do around the Ramzan time in Hyderabad? Just LBB it! Do note that the dates might vary between June 3 and 4. Think Goa is not for Monsoon and off-season? We entreat you to think otherwise. Goa is at its greenest, prettiest when it rains, but it's also less crowded which makes it perfect for driving through the desolate streets and pampering those street pups. While a few cafes/restaurants along with water activities will be shut, the good peeps behind LBB, Goa fully intend to make your off-season travel kickass too! Kashmir in August — oh, what a treat to eyes! Pahalgam or the Valley Of Shepherds is pleasant around this time of the year, and you can set off on long brooding walks, all by yourself. Be sure to check out Kolahoi Glacier, River Lidder, Avantipur Temple, Aru Valley. You'll be surrounded by pine trees and coniferous forests, making for a sweet, slow-moving holiday. Dooars or Duars in West Bengal is sort of a hidden gem, but well-connected from Kolkatta. It has the best of all the worlds. No, really. Located right at the foothills of the Himalayas and north of River Brahmaputra, these floodplains are also the gateway to Bhutan. It abounds in tea gardens, forests, riverbeds, and national parks, and we cannot tell how magical the sunsets are! So, the next time you want to chill in a quaint town that's never crowded, let Dooars open its doors for you. So much is said about Bundelkhand and its history in our textbooks that it almost seems like a sin to not indulge in a true Bundelkhandi culture. No better place to start than Orchha — a riverside town that was established by Rudra Pratap Singh in the 16th century. Full of forts, temples, and ruins, you can kayak or go boating on Betwa River with stunning views of Chhatri, which are basically dome-shaped pavilions. Fond of food? The Bundelkhandi cuisine with dishes like Bundelkhandi Kebabs, Bafauri (channa dal fritters), Maheri (a dish made from buttermilk and dal which is usually eaten for breakfast), Raas Ki Kher (a sugarcane juice-based kheer), Bhutte Ki Kees (grated corn fry) will keep your cravings sorted. If your kind employer gives you two holidays for Christmas or you have a massive shut down of over a week for Xmas, my friend, you're in for a treat. The Rann Of Kutch is gleeful and full of mirth with Rannutsav in action. The white sand desert near Bhuj — Dhordo (also known as the Tent City) is decked up from November to mid-February for a carnival that brings together Gujarati traditions of culture, art, food under the tent. Expect soul-stirring music, memorable sunsets, adventure activities, and if you're there on a full moon night, what a moment you'll experience!